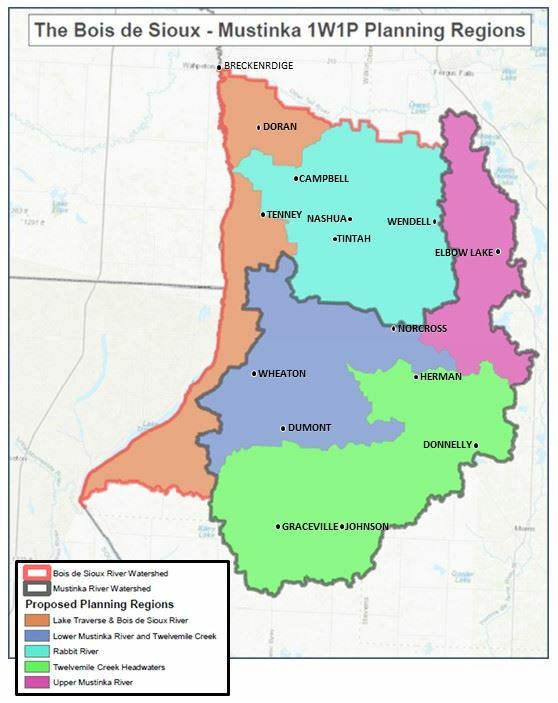 In 2015, the Minnesota Legislature enacted a requirement that, by 2025, watershed districts, soil and water conservation districts, and counties organize and develop focused implementation plans based on watershed boundaries. This coordinated effort is referred to as One Watershed, One Plan (1W1P). We have two watersheds (the Bois de Sioux and Mustinka) and one plan that spans six counties: Big Stone, Grant, Otter Tail, Stevens, Traverse, and Wilkin. We strongly encourage residents within the Bois de Sioux and Mustinka Watersheds to attend. Residents will learn about issues in our watersheds and about the 1W1P process. The public is asked to provide input on priorities and concerns, and will have an opportunity to ask questions of planning participants. Search the Bois de Sioux!